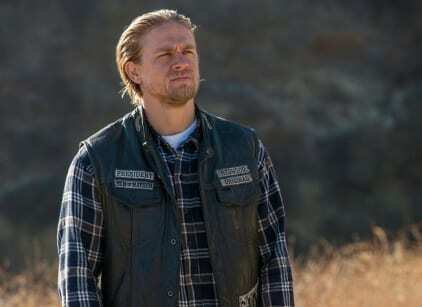 Jax considers stepping down after getting Bobby's eye in a box but Chibs convinces him that the club needs him. Moses Cartwright sends word that he's holding Bobby and if he doesn't get the location of the body on Pope property, the statement and the mother and son, he will cut off another body part every 24 hours. SAMCRO finds out that Gibbs (the young man they killed) was actually Jury's biological son. When Jax confronts Jury, he says he wanted Jax dead but swears he didn't rat him out to the Chinese. When the two come to blows, Jury reaches for his gun and Jax shoots and kills him. Jury's VP is furious that Jax killed Jury without taking it to a vote. Abel is sent home from school for hitting another boy in the head with a metal lunch box. The school wants him evaluated but Gemma won't hear of it. When they arrive back home they find all of Gemma's birds dead and left in her bed and a message scrawled on the kids' bedroom wall: No Son is Safe. Nero tells Wendy that he's selling out Diosa and moving to the farm soon and that she, Gemma and the boys are invited to come along. Juice offers to make a deal with the DA. He'll point the finger at Lin's men and tell the DA where the murder weapon used in Tara's murder is located. Unser figures out that Juice is doing this to get close to Lin and kill him in prison in order to be let back into the club. Jax sends word to Moses Cartwright. He'll tell him where to find the body and turn over the statement but he won't hand over the mother and son for them to be killed. Cartwright responds by sending Jax another box after cutting off Bobby's thumb.